Having founded AL DÍA News Media in the living room of his own home in North Philadelphia in 1992, Hernán Guaracao transformed an initial eight-page newsletter experiment into a fully-fledged news media organization with local, regional and national recognition and impact. A company based on integrity and excellence in journalism, devoted to a true spirit of service, AL DÍA has proven that quality journalism can still exist and thrive, even under the demanding circumstances of news media in the twenty-first century. AL DÍA has consistently excelled at publishing news content that challenges traditional stereotypes about US Latinos and continuously offers to its readers, both in English and Spanish, a more comprehensive perspective of the ethnicity that is transforming America. 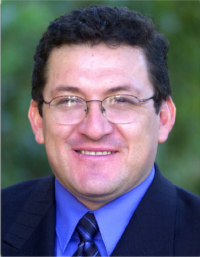 Hernán’s academic credentials include a Master’s Degree in Journalism from the University of Iowa, in Iowa City, which he attended from 1988 to 1991 on a Fulbright Scholarship. He also holds an undergraduate degree in Mass Communication and Journalism from the University of Bogotá “Jorge Tadeo Lozano”. Aside from his duties as Publisher, Hernán has served at the helm of Latino print news media industry in the United States. Hernán was President of the Board of Directors of the National Association of Hispanic Publications (NAHP) from 2002 to 2004. Simultaneously, he served as a Board Member for the Hispanic Association on Corporate Responsibility (HACR), a national organization working with the largest corporations in America to include US Latinos in governance, procurement, employment and philanthropy. Hernán is also a Board Member of the Greater Philadelphia Chamber of Commerce, and a Board Member of the Pennsylvania Newspaper Association Foundation. Currently, Hernán serves as chairman of the AL DÍA Foundation, which grants the “Felix Varela” Award for Excellence in American Journalism on Latino Issues. The Foundation is currently providing several one-year fellowships for recent journalism school graduates interested in multicultural, multimedia and multilingual journalism.